Bus from Kuala Lumpur to Tanah Merah is the cheapest mode of transport plying between Kuala Lumpur and Tanah Merah. Many locals especially working adults and students rely on express bus to travel from Kuala Lumpur to Tanah Merah. Therefore, express bus from Kuala Lumpur to Tanah Merah plays a major role to connect the people between two cities. Perdana Express and Transnasional are the two famous brands serving bus from Kuala Lumpur to Tanah Merah. Perdana Express is the dominant player between them by providing 4 trips daily from Kuala Lumpur to Tanah Merah. Both players are operating the bus route with spacious seating VIP bus. The only difference between them is that Perdana Express deploys double deck bus while Transnasional deploys single deck bus. The bus ticket for bus from KL to Tanah Merah is either RM 44.00 or RM 48.90 depends on the choice of the bus operators. 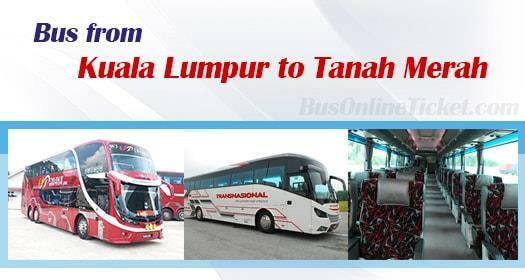 Duration required for bus from Kuala Lumpur to Tanah Merah takes about 7 hours depending on traffic and climate condition. At least 1 washroom break will be given during the journey. The boarding point in Kuala Lumpur is at the Terminal Bersepadu Selatan (TBS). Terminal Bersepadu Terminal Selatan (TBS) is the largest and modern bus terminal in Kuala Lumpur. Passengers can easily travel to TBS by public bus, taxi, KTM or LRT. The drop-off point in Tanah Merah is Stesen Bas Tanah Merah. Even though there are daily bus schedule available for bus from Kuala Lumpur to Tanah Merah, we strongly advise you to purchase your bus ticket online to secure your seat. Do not hesitate and book your bus ticket online now with BusOnlineTicket.com to earn BOT Miles to redeem your discount code. It's easy, quick, and secure to book your bus ticket and make payment online with BusOnlineTicket.com.